The MIT Outing Club won the first ever intercollegiate Presidential Range Relay Race, a 22-mile race across Mount Washington and the Presidential Range in New Hampshire’s White Mountains last weekend. Schools from all over New England, including Dartmouth, Bates, Colby, Castleton, Plymouth State, and Green Mountain, participated in the race organized by Tufts Mountain Club. Three MIT teams competed, the Crazy Alpine Beavers, the Fast Alpine Beavers, and the Faster Alpine Beavers. On the winning Crazy Alpine Beavers team, which finished in 7 hours and 30 minutes and beat the nearest competitor by over 90 minutes, were Eric W. Gilbertson ’08, Matthew W. Gilbertson ’08, and Daniel G. Walker G. Neither of the other two MIT teams finished the race. The race course began at Crawford Notch and roughly followed the Appalachian Trail up Mounts Jackson, Pierce, Eisenhower and Monroe to Mount Washington at halfway, then across Mounts Clay, Jefferson and Adams to Mount Madison, gaining a net 9000 feet of elevation along the way. The course finished with a steep descent down to Appalachia. Mount Washington, famed for having the ‘worst weather in the world,’ was luckily sunny and clear for the race, albeit cold, with a wind chill around zero degrees Fahrenheit. Conditions were treacherous in places, with patches of snow and ice covering the rocky trail. Although most teams chose to run the race as a three times seven-mile relay race, with exchanges to relief runners at Mount Eisenhower and Mount Jefferson, the Crazy Alpine Beavers decided to complete the whole 22 miles without an exchange. Only one other school, Plymouth State College, attempted such a feat; however, the trail proved too difficult for them to finish. Although the team started later than most other teams in the wave start, they passed all but one team before the first exchange. 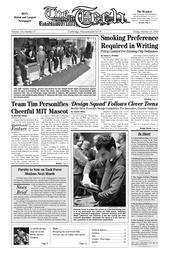 MIT quickly reeled in and passed the remaining team while climbing Mt. Monroe, the first peak of the second leg. The team maintained its pace to widen its lead throughout the remainder of the race. Team Crazy Alpine Beavers plans to compete again next year to defend its title. Also participating in the event as Team Faster Alpine Beavers were Michael A. Kokko G, Zach J. Traina G, and Jonathan M. Hanselman ’09; Team Fast Alpine Beavers was comprised of Kathryn P. D’Epagnier G, Luisa Chiesa G and Tom Kirchofer.